Watch MUVE's easy dance exercise on chairs. Follow the simple movements to rejuvenate body and mind. This is a free video workout easy to do at home. Featured stretching exercises are gentle and feel great. 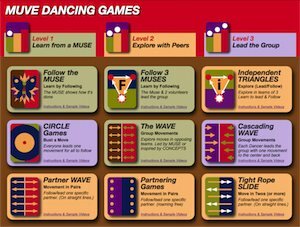 In this Follow the Muse Dance Game, Maggie dances in the center position as the Muse, the lead dancer. The other dancers follow loosely. There is no need to be precise. MUVE dancing is about having fun and exploring creative dance moves. When you follow someone else you are likely to discover new movements and learn a thing or two. Go ahead and dance along to this video right now. The dance above is from the Mellow MUVE DVD, a beginner dance exercise dvd you can buy at the MUVE store. MUVE low impact dance videos are filled with fun activities for senior citizens and their families. This looks like a great tape! I would like to try it! I love the Hawaiian songs for exercise. They encourage flowing and relaxing dance moves. I would love to purchase a DVD video of one. How do I order it?